Citizens gathered at the Washington Monument, where speakers outlined the last chance scenario for reversing climate change. While nowhere near the entire solution, stopping the Keystone XL pipeline offers the biggest win in the war for survival. Bill McKibben, founder of 350.org, opened the program with the demand that President Obama live up to his campaign rhetoric and stop the pipeline from crossing the Canadian border. That action would devastate the corporate partnership of Enbridge, TransCanada, and the other vultures seeking to profit at the expense of everyone else. Michael Brune, executive director of the Sierra Club, argued that the coal and oil industries are on the run. He cited energy use estimates for Texas, Colorado, and other states that show 30% of energy needs will be met by alternative fuels. Brune chained himself to the White House fencing February 14 in the Sierra Club’s first sanctioned act of civil disobedience in 120 years. Senator Sheldon Whitehouse (D-RI) told the crowd that this is our time to stop the tragedy of allowing the filthiest energy source in the world to cross our borders. 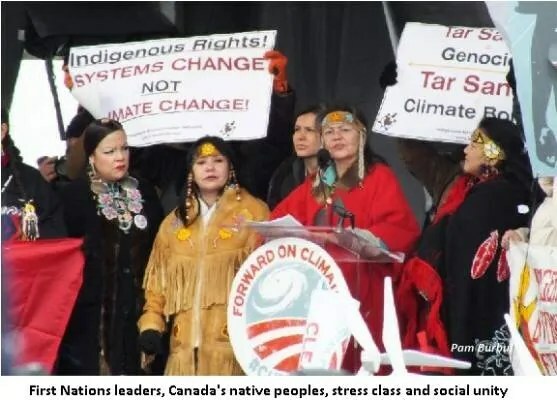 There were representatives from the Latino and Africa American communities plus officials from Canada’s First Nations peoples in Alberta and British Columbia. Chief Jackie Thomas and Crystal Lamemon spoke eloquently about the need for cross cultural, multinational alliances. The struggles of native peoples in Alberta near the tar sands mining and the British Columbia transit path were graphically detailed. The 40,000 gathered then marched from the monument to the White House, where they gathered and sent their message to the president — do not approve this pipeline. The most common chant from the crowd was, Hey Obama, we don’t want no climate drama. The least controversial estimate of human tolerance for increases in carbon dioxide was set at 565 billion additional GtCO2 (Gigatons of carbon dioxide) released into the atmosphere. Once that limit is exceeded, the climate will be sufficiently damaged to produce a regular parade of climate catastrophes. The crises will be more frequent and intense due to storms, floods, droughts, and the loss of arable farm land, famine, and disease. These calamities will accelerate human suffering and death. The shortages in food and the disruptions to economies are the essential ingredients for riots, civil war, regional, and world wars. The general consensus is that there remains oil, coal and other fuel deposits that if burned would emit 2,795 GtCO2 into the atmosphere. That’s five times the outside limit leading to global disaster. There are climate change deniers that challenge reality. Their work doesn’t make it into scientific journals because the deniers are not doing science; thus they lack evidence to justify their claims. They are part of a well-funded public relations campaign to raise doubts about the clear and present danger facing people everywhere. These pseudo scientists publish in an online Potemkin Village of energy-industry-sponsored association journals that, for all appearances, look just like real scientific journals. Bigh quality graphics and environmentally friendly trade names cannot cover the poverty of evidence and arguments served up in this toxic brew of disinformation. This president was first elected with the promise of ending the Iraq and Afghanistan wars and reviving a collapsed economy with a true unemployment rate of over 20% (when you actually count those unemployed). Many expected that the crooks that collapsed the economy through their reckless scheming would face legal action or, at the very least, stop receiving bonuses with our tax dollars for their greed and stupidity. We all know how well that worked out. Obama’s reelection had more to do with his hapless opponent, Mitt Romney, who made mistake after mistake. The election looked closer than expected and then we saw the mega storm, Sandy just before Election Day. New York City Mayor Michael Bloomberg endorsed of the president arguing that Obama was, the more likely of the two candidates to take “immediate action” on climate change. Obama is, indeed, no Mitt Romney. But since the election, the president’s effort on climate change is another matter. Where’s the national or international crash project to conserve energy, clean up current CO2 sources, and develop alternatives? Did we all miss something? Where was the rousing rhetoric from the inaugural address over the past four years? Where was the public education required to bury the climate change deniers once and for all? Don’t the people have the right to know the truth? It is safe to assume that the president’s concern for the environment is enhanced to semi-believable only in the face of his opposition, the climate change deniers and those in the financial and corporate elite who bankroll that operation. Obama, at best, is dispassionate about the perils of climate change and, at worst, cynical. There is no evidence over the past four years that the president sees any urgency to act. Obama wanted to nominate Susan Rice for Secretary of State. Ms. Rice was holding an array of stocks and investments in the Alberta tar sands digging and pipeline related companies. Surely, Obama was informed of this fact. As Secretary of State, Rice would have held the final recommendation on the project since it is an international effort. Obama has no core belief system. He was antiwar but then decided to take years to appear to shut down Iraq. He got NATO to wage a war of aggression in Libya. The administration has fostered a civil war in Syria that has so far failed only because the Libyan formula for regime change wasn’t allowed by the United Nations. He’s for civil rights but has drones killing people, including U.S. citizens, around the world. He’s pro labor but failed to do anything for union rights. Why should it be any different on the environment? It hasn’t so far. Obama doesn’t want to take the political hit for losing the jobs that Keystone XL might provide. He has done little to confront the massive unemployment rate and this might get him in some trouble. At the start of this debate, Obama said that the tar sands oil would be exported to China somehow even if he blocked the U.S. transit route. Why not get some jobs for citizens if it’s going to happen anyway, Obama led us to believe. There are a number of reasons and indicators that Obama will nix the deal. President Obama received open letters supporting pipeline approval from the U.S. House of Representatives and Senate with signature totals of 145 and 53 respectively. That’s a less than that 33% of House members and a little over 50% of the Senate. These are not overwhelming numbers for public letters. That represents the opportunity to stick it to his most rabid opponents in the House and Senate and solidify the public majority for environmental progress. Kerry has a generally pro-environment position and seeks to appear that way when he’s not. With his wife, Teresa Heinz Kerry, the secretary of state wrote This Moment on Earth, an argument for pro-environment policies and an appreciation for activists and innovators working for clean energy. Kerry is no candidate for membership in the Earth Liberation Front but he’s a lot closer to environmental awareness than the volatile Susan Rice and his new boss. 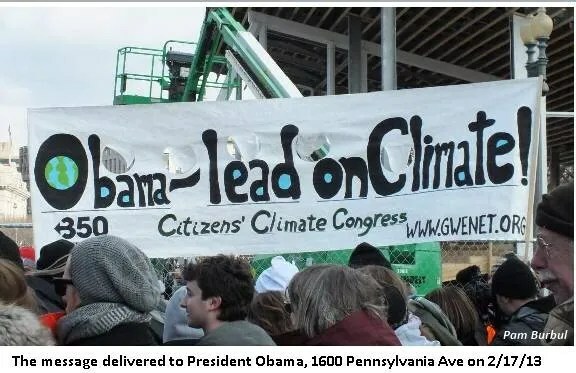 Obama may move out of his grandiosity enough to realize that he can’t tap dance around the issue of climate change any longer and hope to survive his presidency with the support of a large, ardent faction of environmentally aware citizens. This is a litmus test, a gut-check that will determine how millions will see the president. He survived past wavering on vital issues due to the atrocious nature and policies of his opposition. This time, the decision is all his. There will be no crazy Senators threatening a filibuster or delaying legislation. The buck stops right in the middle of the president’s desk. Sadly, there shouldn’t even be a decision to make at this point. This decision should have been preempted by an announcement sometime after his first election. Obama could have outlined the threat climate change poses to people everywhere. He could have buried the deniers with the force of science and strong arguments. And he could have let everyone know that failure to take climate change seriously was suicide for those alive in 15 to 20 years and an act of assault and battery against others who will suffer due to the willful, nihilistic, deranged notion that we can continue with business as usual in our treatment of the environment and our policy-making process. It’s not a matter of Earth in the balance. The earth will survive, no matter what we do. The real issue is making every effort humanly possible to save the environment in order to maintain a livable habitat for human beings. If we’re fortunate enough to have more time, then there is no excuse for delay on the obvious decision on this and other urgent efforts. 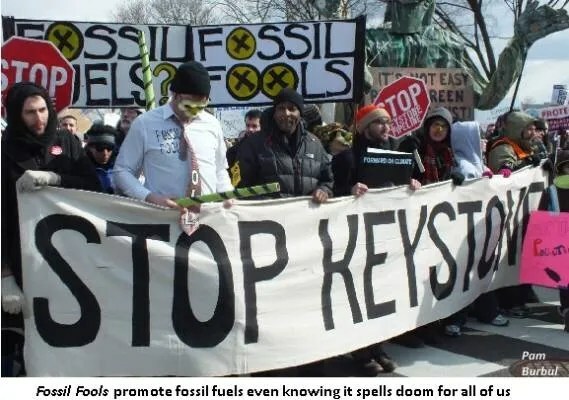 The Keystone XL pipeline must be rejected today. The overwhelming, indisputable truth about the dangers of climate change must be revealed with great urgency. The game playing and lying need to stop right now. Anything less is beyond comprehension and beneath contempt. Special thanks to Pam Burbul for the photographs and to Jillian for her help comments. This entry was posted in Energy, Environment, Human Rights Civil Liberties, NWO and tagged canada, climate change, climate crisis, co2, first nations, greed, Keystone XL, pipeline, pollution, tar sands, usa. Bookmark the permalink. What is this piece of propaganda doing in COTOReport?